HDMI converter for Google Chromecast, ChromecastUltra, Roku Streaming Stick and Amazon FireTV Stick. 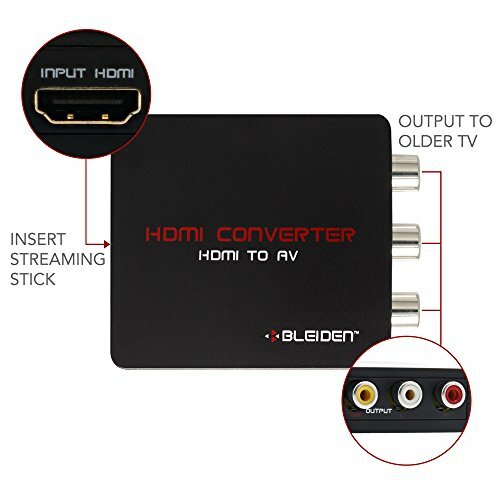 This device will convert the high-definition HDMI output from a Streaming Stick into standard definition AV output used by most older-model TVs. Includes HDMI to AV converter, power cable, composite (red/white/yellow) cable and instructions. Installs in minutes. Use Google Chromcast, Chromecast Ultra, Roku Streaming Stick and Amazon Fire TV Stick with Older Model TVs! Converts HDMI signal from Streaming Sticks into standard definition HDMI. Installs in minutes and is fully-compatible with Amazon, Google and Roku Streaming Sticks. Includes Converter, Power Adapter and Composite Video Cable. Streaming Sticks sold separately.